What we know about the double murderer who is on the run in Sydney. In 2001, Damien Anthony Peters, then in his 30s, murdered and dismembered two of his lovers in his Surry Hills apartment in Sydney’s inner suburbs. Tereaupii Akai, 50, was stabbed twice in the neck, before his body was cut up and dumped in a council bin. Eight months later, 57-year-old Bevan James Frost was stabbed to death while getting a massage from Peters. His body was also cut up. His remains were found in Peter’s bath, while they were investigating Akai’s disappearance. Peters escape is being covered across all media platforms, as police try to track him down. See below, post continues after video. He claimed he had tried to leave Mr Akai several times but was always manipulated to stay. His counsel told the court principles of battered wife syndrome applied in this relationship. In 2002, Peters was jailed for 21 years, with a non parole period of 13 years. In November 2016, he was granted parole, after 17 years behind bars. Peters wore an electronic ankle bracelet, and had done ever since he was released from prison. It monitors his every move. However, over the weekend, while receiving medical treatment at Prince of Wales Hospital in Randwick, Peters, 50, managed to “forcibly remove” his anklet. It was found discarded near Kensington. Ever since 4.15pm on Sunday afternoon, Peters has been untraceable. Police have been undertaking a widespread manhunt ever since, and they’re concerned…telling anyone who spots him not to approach, and to call triple-zero immediately. He is described as being Caucasian, about 175-185cm tall with a muscular build and short brown hair. He had a tattoo on his upper arm of a snake wrapped around a panther and tribal style tattoos on his upper left arm. In December 2014, the then Attorney General Brad Hazzard announced an upgrade of its electronic tracking device equipment. Hazzard said the new devices were five times stronger than existing ones, making them tamper proof. The anklets in question are the ‘Buddi Insight Smart Tags’. They are built in the UK, and are described as “lightweight, accurate and durable.” They are made from the same material as a bullet proof vest. They provide instant alerts and evidence in the event of tampering, removal, loss of communication and entering or leaving set geographic zones. They’re supposed to assist with the reintegration of offenders back into the community. New South Wales claims, it’s a big cost saver for the state’s judicial system. 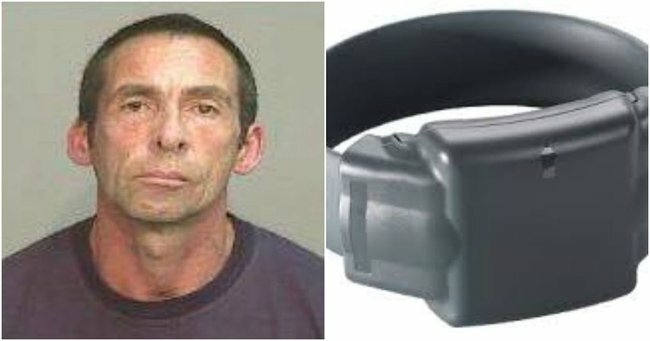 The Sydney Morning Herald reports the tracking devices are deliberately designed to be able to be removed for extreme circumstances such as a medical emergency – and can be taken off using bolt cutters. However, it is yet to be confirmed how Peters broke free of his device. Police believe he acted alone, and is still in Sydney. There are currently 614 electronic monitoring devices in NSW, fitted to parolees considered high risk and those serving home detention. Why is a double murderer out of jail so soon? This is a question that keeps popping up in the wake of Peters’ escape. Since the abolition of the death sentence in 1973, ‘life imprisonment’ is Australia’s most severe sanction under criminal law. In some states and territories life imprisonment is mandatory in convictions of murder. But that also varies across jurisdictions. It can mean anything from a non-parole period of 10 years, to the full term of an offender’s life. The NSW Bureau of Crime Statistics says the average term of a life sentence is 25 years. Peters did 17 years, so nearly 10 years over the minimum sentence for Australia’s most severe sanction. When sentencing an individual, the court applies sentencing principles to determine an appropriate sentence for each individual. The Crimes Act of 1999 lists various factors that the magistrate or judge can take into account including age, mental state, if remorse is shown, and prior criminal history. That is why some murderers get lesser or greater sentences than others. The Sydney Morning Herald reports the State Parole Authority took into account Peter’s completion of relevant programs and counselling before releasing him. “His participation in external works release and day release programs the offender’s behaviour in prison and his minimum-security prison classification,” was also considered, a spokesperson told the publication.